/ Barbarella Leather Pinafore by Isolated Heroes / Scottish designers Isolated Heroes are a luxury street wear label that was a nominee for the 2012 Scottish Fashion Awards and currently have a shop on Asos. According to their “about me,” the line wants wearers to “escape to a hyper-realistic dystopian world… transforming them into a surrealist, avant-garde tribe of future primitives.” That sounds sorta terrifying but, with clothes like that, we’re down! 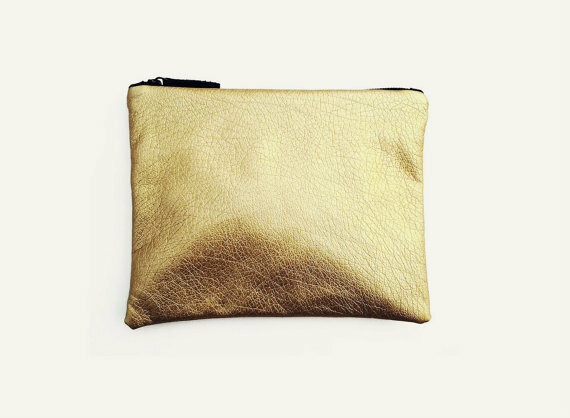 / Gold Metallic Clutch Purse by CoralsandNuts / We found CoralsandNuts on an Etsy binge and were immediately taken by the slouchy metallic bags. The line out of India features everything from embossed Zodiac symbols to punch-out leather to sequins. At around $50, the prices seem more than fair for handmade, artisan goods. / MinkPink Third Base Metallic Tee on Nasty Gal / This gold and black tee is on the more lowkey end of the metallic spectrum. It’s a comfortable baseball tee cut but good for dressin’ up an otherwise just okay outfit. / No Place Like Chrome by Essie / We’re imagining metallic nails paired with all grey and/or black ensemble and a bright piece of jewelry to finish it off. These nails speak for themselves, plus you can kinda freak people out with extremely reflective nails. Also, we wanna be the people who come up with names for nail polishes because “no place like chrome” sounds like a lot of fun.